Jon Danzig's World: All aboard for Brexit? All aboard, please. Do you have a ticket? That’d be David Cameron. But Theresa May is also here. She’s the navigator. She says the EU is the best destination for the nation! Sharp U-turn ahead. Hold on to your seats. Change of plan. We’re not going to the EU. Oh, he got off a few stops back. Well, for a while there wasn’t anyone in control. But don’t worry we have a replacement driver now. It’s Theresa May. She says Brexit is the best destination for the nation! Yes, I know. But the passengers had a vote and told her to change direction. She just does what she’s told, see. (So long as it suits her). Sorry mate, we’re full steam ahead. Theresa’s put her foot down. Not possible. This is a one-way trip. Brexit, here we come. Yes, that’s right. Same bus, new route. Theresa May is in control now. It’s her name on the bus. She’s taking us to Brexit. There’s no turning back. Oh, nothing to worry about, I’m sure. 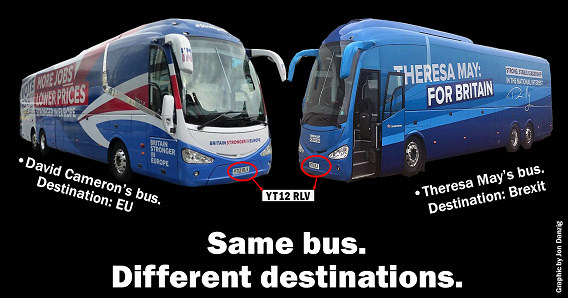 Theresa is a strong and stable bus driver. Yes, it may seem that way. Thing is, she doesn’t know the exact route to where we’re going, or even where we’re going to end up. It's not entirely up to her, you see. The previous driver, David Cameron, said it was like a leap in the dark. Exciting though, eh? Well, there’s only one chance of that, just ahead, in about 25 days time. If enough passengers decide, on 8 June, we could change driver, we could even change destination. But after that, there really is no turning back mate.